Filmmaker Tim Sullivan visited the author’s home last year and sat down with him for a final interview. 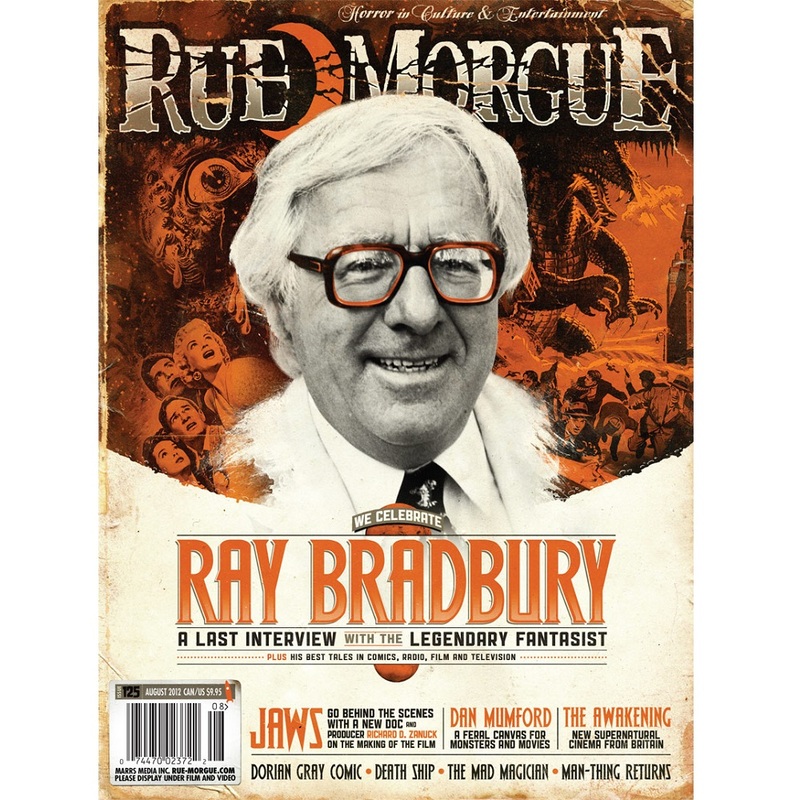 In this Rue Morgue exclusive, we get a very intimate look at the late literary legend. PLUS: A roundup of some of Bradbury’s best contributions to EC Comics in the 1950s, and the most impressive TV, movie and vintage audio adaptations of his work. A new in-depth documentary examines the lasting impact of the biggest horror movie ever made, Jaws. PLUS: Producer Richard D. Zanuck takes us back to the beach. Fuelled by metal and a love of ’80s horror movies, Dan Mumford’s art gives even the fiercest beasts a touch of grace. The Awakening pits a diehard supernatural skeptic against a house with a horrible past. 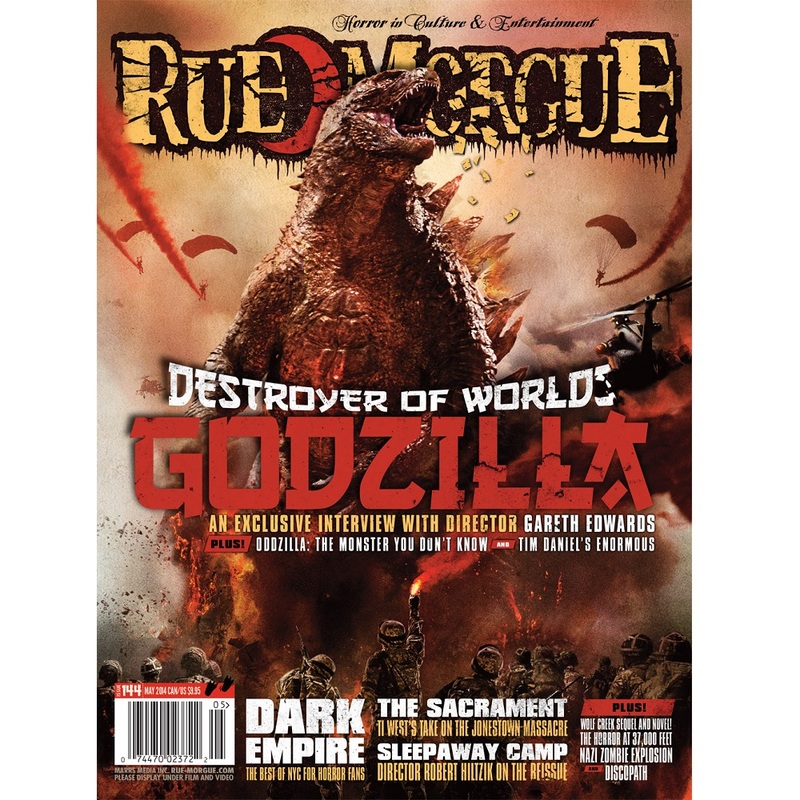 Exorcist play updates original novel with modern evils; Slipknot launches Apocalypse-themed music fest; First and final Man-Thing comics to be released together this Halloween. Weird stats and morbid facts. Sick Top Six: Villainous Volumes. Lego Monster Fighter Sets, Zombie Bath Salts, Cthulhu Tiki Mug, and Frankenstein Tissues. CineMacabre features reviews of Prometheus, [REC]3 Genesis, Abraham Lincoln: Vampire Hunter, The Devil’s Carnival, Beyond the Black Rainbow, A Little Bit Zombie, George: A Zombie Intervention, The Zombie Farm, and Zombie Chronicles. Reissues reviews Chillers (1987), Gums (1976), Mystery Science Theatre 3000: Samson vs. The Vampire Women (1982), and Where Evil Lives (1989). Spotlight: Chelsea Cain’s Kill You Twice. Library of the Damned hunts down some New Zealand genre lit. Plus, reviews of Prometheus: The Art of the Film, Mysterious Minnesota: Digging Up the Ghostly Past at 13 Haunted Sites, John Hornor Jacobs’ This Dark Earth, Stephen Graham Jones’ Zombie Bake-Off, Caroline Munro: First Lady of Fantasy, Kim Newman’s Anno Dracula: The Bloody Red Baron and Laird Barron’s This Light is the Darkness. Menu: Dear God No! and The Turnpike Killer. Featuring the costumed theatrics of A Band of Orcs. The Devil’s Playlist grills death rapper Necro. Plus, reviews of Predator OST, Piranha 3DD, The Pact OST, Vampires Everywhere!, Skinny Puppy, Nachtmystium, Denial of God, Zombiefication, and Satanic Bloodspraying. The Literature of Terror (1980). 15 new subscribers will win a copy of Jaws on Blu-ray courtesy of Universal Studios Home Entertainment.